A focus group can give your employees a voice, increasing Employee Engagement and helping measure the impact of strategic change. These groups are qualitative in nature. They are meant to uncover perceptions and examine theories. They allow you to dig deeper into interview and survey results and ask the “why?” and “what if?” questions that can help inform your strategy. How many groups? The key is to get a good sample of the different stake holders. Think demographics – in an organisation you will need managers, sales, admin, marketing, production, men and women representing all functional areas of the organisation. The magic number 12. A focus group works best with 10 – 15 participants. Fewer than 10 (or more than 15) respondents significantly changes the group dynamics. Aim for 12 participants. Listen for opportunities vs. just answers. The facilitator must be open to ideas and thoughts from the group members, and not just concentrate on trying to get answers to pre-set questions or find the “proof” for their theories. The facilitator should be willing to explore deeper than the surface answers offer. 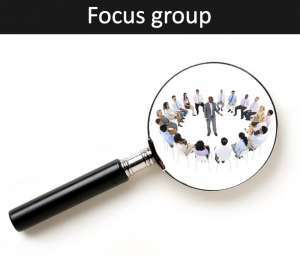 Surface or forced answers are often a problem within focus groups. Let them talk. Instead of trying to get answers to a strict set of stock questions, let the respondents have a natural conversation. Remember there may be a disconnect between what people say and what they would actually do. Where the culture is in disharmony (where people spout the “party line” ) they may actually act in a different manner. They sometimes say what they think is expected to avoid censure. Guide them into deeper conversation through the questions. Get them all talking, encourage the wallflowers, and reign in the opinionated chatterboxes. Start the group with an exercise that gets everyone talking e.g. Ask all participants to answer a simple question in writing, such as “How well does this organisation communicates with you?” Ask them to read out what they’ve written. This gets the conversation going, the answers are normally very interesting and a great starting point. Prepare for different personalities. Remember extroverts will often dominate the conversation in the group if not managed. The opinions of the introverts are just as valuable and necessary as those of the extroverts. Try place the introverts together so they won’t shrink into their shells during the focus group. Use an experienced facilitator. The facilitator’s job is to help guide the conversation and uncover the respondent’s attitudes, feelings, beliefs, experiences and reactions. Facilitators should be able to bring out the deeper meaning behind participant’s answers. Take at least a half hour break between groups to do a “brain dump” of what you learn, have some water, eat something and look for themes in the discussion.